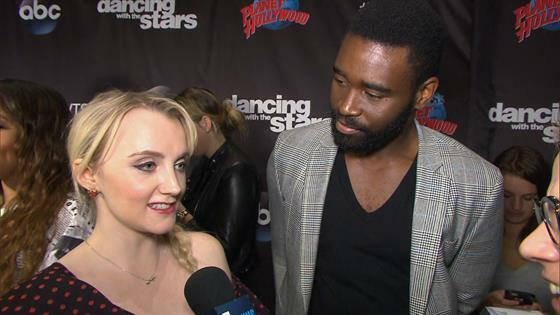 Why Is Harry Potter's Evanna Lynch Competing on Dancing With the Stars? Dancing With the Stars has had its fair share of head-scratcher contestants, contestants who inspire a, "Really? Why are they doing the show?" reaction. This year, that's Harry Potter star Evanna Lynch, best known to Potterheads as Luna Lovegood in the wildly successful movie franchise. "I wanted to learn to dance," Lynch told E! News after the DWTS cast reveal. "Yeah, it's like a dream job. I just had no reason not to. As I said, I like being pushed. I've said that to Keo, I was like, ‘Be hard on me.' That's what a like, when you have that kind of pressure on you that's when the most growth happens." Lynch is competing for the Mirrorball trophy with pro partner Keo Motsepe. The two said the competition is strong, but Motsepe said their chemistry will shine on the stage. "We just vibe very well, so I can't wait for people to see that," he said. Might fans see Lynch bust out her Harry Potter and the Deathly Hallows Part 1 dance? People have been asking, Lynch said, but her partner hasn't seen the movie. "In one of the Harry Potter films, they dance at a wedding," she said, demonstrating the moves. Motsepe has seen the clip. Will it make its way into the competition? "For sure," Motsepe said. "I'm going to turn it into an amazing move." Lynch is well-known to fans for her role in the movies, but she's going to surprise people, according to Motsepe. "I don't think people know her as Evanna, so I'm excited for people to know her personality as Evanna and not a character on TV," he said. And if they make it far into the competition it won't' be because of magic. "I am very stubborn, and I am very determined," Lynch said, noting her quietness in real life and the characters she plays isn't the only thing that defines her. "I am very fiery." Dancing With the Stars premieres Monday, Sept. 24 at 8 p.m. on ABC.